If Internet is one of your primary marketing channels, you are in an extremely competitive arena where the tools to enhance your online presence and online brand image are of utmost importance. You can hire IT staffing services for Full Time Equivalent (FTE) experts from Outsource2india who will provide services in any of the three areas that are key to successful marketing on the World Wide Web, namely Search Engine Optimization (SEO), Search Engine Marketing (SEM) and Social Media Optimization (SMO). Outsource your staff augmentation services for SEO to Outsource2india for low cost, high quality search engine optimization/SEO Services. If you want to increase your organization's visibility in the search engine page results (SERPs) through on and off-page optimization and paid marketing tools, our dedicated Search Engine Marketing (SEM) professionals can be of use. Our SEM experts will enhance the effectiveness of your online marketing strategy and ensure that you get the best value for your investment. Whether you are looking at paid inclusion, paid placement on a pay-per-click (PPC) model, contextual advertising including semantic targeting, editorial or in-text advertising, or any other SEM technique, O2I's IT staffing services for SEM are of great help. SEM professionals that we provide on a full-time basis have substantial knowledge of all these including the potential of SEM and how it can work for you. More importantly, our search engine marketing experts have an extensive experience in working with these tools for several global customers, which enables them to plan and implement an appropriate online marketing approach that will certainly work for you. Contact us to outsource SEM initiatives. Focus on your core business while our specialists work on your SEM campaigns full-time. Our SMO experts can also help you derive other benefits from the social media such as market research, product and customer satisfaction feedback, employee morale and corporate climate assessment, attracting potential employees and managing public relations. 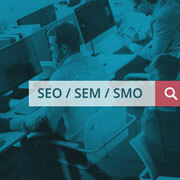 Our SEO/SEM/SMO professionals will function as full-time employees for you, working eight hours a day, five days a week. We provide the space and all the HR and administrative support, while you only need to manage their day-to-day performance and get desired results. Find out more about our Staff Augmentation Services and contact us for IT outsourcing complete staff augmentation services for SEO / SEM / SMO.